So up the lift, then up another 5 flights of stairs and we were out on the roof of the tower, 260m above ground. Again, as a media moment, it was a bit hit and miss. 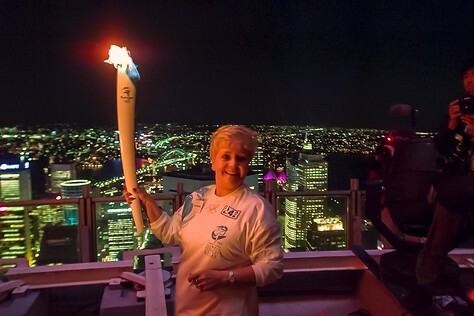 Our torchbearer was Vera Ipiniche. 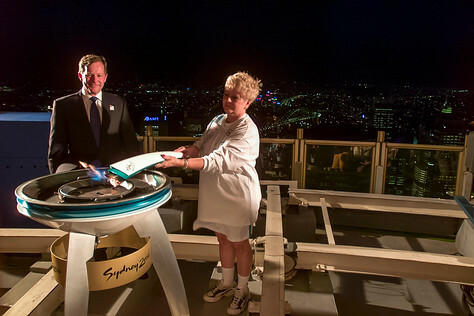 I’m not sure what she did/does – but it was a bit of a shame to have such an iconic moment with all of Sydney laid out as a backdrop but not to have an iconic person holding the Flame. But then it didn’t matter so much because the wind was so strong it was almost impossible to stand up or pose in any sort of meaningful way. It was also a bit of a messy area to be shooting from. And my camera was absolutely terrible in low light so trying to match the torchbearer, the Flame and the city lights all in one frame was never going to be a great success. But I got a few shots to record the moment. 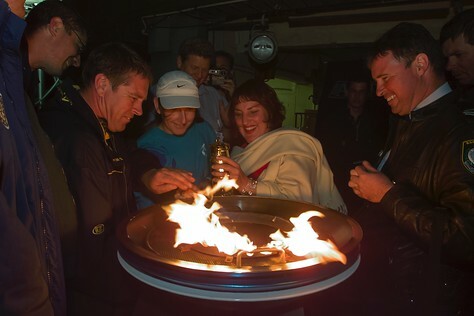 The entertaining part of the experience was trying to take the Flame off the cauldron and back into the safety lantern. The wind was so strong it blew the wick out every time we tried to do the transfer. We tried blocking the wind with bodies. Then someone found a plank of wood in the stairwell and we used that as a wind shield. After about 15 minutes we finally got it back in its safety lantern and we left.